Joe, would you please share your squirrel proofing solution? We have 9 or 10 feeders and our squirrels just laugh at our attempts to keep them off. Thanks for asking Marg and since you asked I went out on the deck and took a shot. As you can see its snowing. 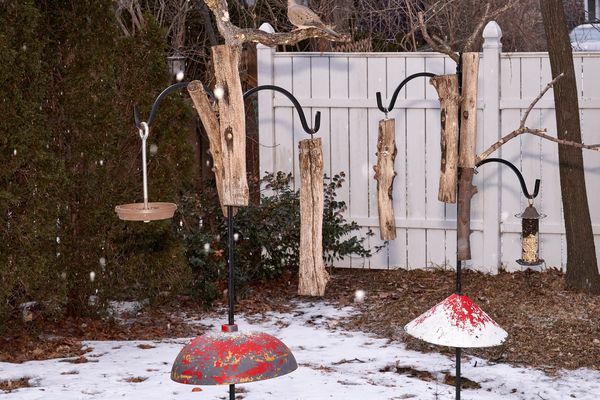 The logs are suet feeders that I made by drilling holes into them which hold the suet. Great for woodpeckers and nuthatches. I have 4-5 Shepard's Crooks in the yard depending on the season. All have different feeders but have the same squirrel baffles. They need paint which will happen when the weather is suitable. All have perches attached. Overall the are not pretty but affective. The baffle on the left is modified. It is designed to hang above the feeder. The right is used as designed. I have them placed a little over 4 feet from the ground. I buy them at Menards...left type about $10, right one About $20. It gets expensive but for me its medicine to prevent neurosis...totally worth it. You would be surprised how far squirrels can jump. Straight up is their shortest jump. Lateral jumps are much longer and downward jumps are even further. Make sure there are no launch points 8-10 feet from the feeders, depending on whether its from above or lateral. Even though it is almost black its a Gray Squirrel. I believe the ears are more pointed on the Black, although I'm not an expert. We often have as many as 8-9 in the yard at the same time. The usual number is 2-3. Now that I have the feeders totally squirrel proofed I don't mind them at all. They are the clean up crew that remove the bird feed that hits the ground. The second one is from the day before. How did you squirrel proof your feeders ? Back up a few post and you will find a complete explanation and photograph. Thanks, Joe! I had previously utilized your perch suggestion and it works quite well. Hopefully this will, too. Stay warm in your blind and hang on - spring is coming! Thank you as well, Marg. I have never seen one of those Joe. It looks like the ears on the second one are pointier than in the first shot. We don't have any of those here. The second shot is way sharp. Great portrait. The black ones in Colorado Springs have sharp pointy ears. I don't remember if I saw them in other areas as well in Colorado. I have photos but it might take all day to find them. Nice shots. But isn't it just a dark gray? Truly Black Squirrels are moving up the CA coast. Eventually, they will take over the territory from the Grays. We used to see both the Black and the Gray when I lived in Silicon Valley. The Blacks were relative newcomers at the time. There are also black and white Kaibab Squirrels that inhabit the Kaibab Plateau on the North Rim of the Grand Canyon. I think its just the viewing angle. Exactly but compared to a normal gray the appear black.